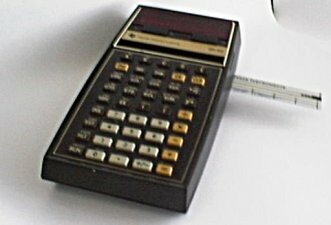 In the mid 1970's I was manager of a department of Texas Instruments engaged in designing and manufacturing some of the first handheld electronic calculators. With each new release of a design we knew we were taking over the market from the older mechaical machines. It was an exciting time of adding new features, improving reliability and driving prices down. I particularily appreciated what the mechanical designers had done before us and I recognized that their products would soon become obsolete and antique. My father-in-law, Arlie Franklin, was a speciality steel expert with Crucible Steel. When mentioned he was working on a consulting contact with a mechanical engineer from Liechtenstein I asked him to see if the guy knew anything about the little mechanical computer which I recalled as being built there. Imagine my suprise when he said he was working with Mr. Hertzstark. I proposed a trade of one of mine for one of his. He accepted and as a result I sent to him an SR52, one of the very first programmable handheld scientific calculators ( I believe it was serial number 106) which featured a magnetic strip reader/writer for progam storage. 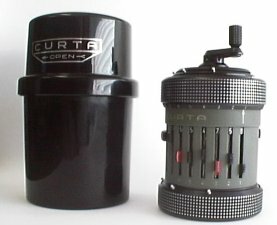 He in turn sent to me a Curta Model II sn 554758. I use it occasionally otherwise it enjoys a prominant place in my office bookshelf. Now 25 years later, I know I made a good trade but would like to know if that sn 554758 is indeed one of the last built.